I love our chalkboard wall command center. We use it to organize our life; Kids school activities, sports, bills, papers, etc. We are a family of five, so we need all of the organization we can get. If you want to make a calendar, you may want to add white paint and a level to the list. Tape off the area you are going to use for your chalkboard. If you plan to use chalk markers, you will need to prime the walls. Chalk markers will not come off of porous walls. To use magnets for your command center, you can use magnetic paint/ primer. I cannot guarantee even after priming that the chalk marker will be easy to remove or will remove completely. There are tips on what markers to use and how to remove the chalk markers. (I use a Mr. Clean Magic Eraser and Windex). 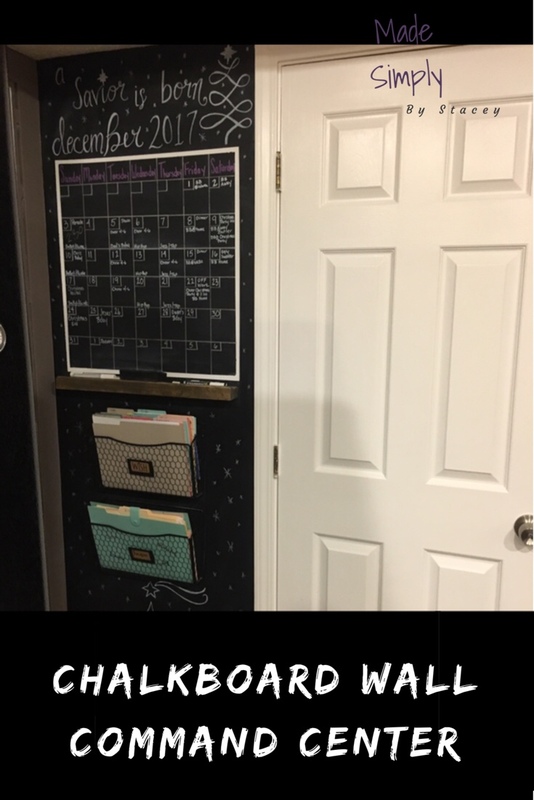 Paint the wall with chalkboard paint. I added three coats. Take off the tape and touch up. Ta da!! You have a black wall. Rub the chalk sideways covering the whole wall, then erase. I used a level, tape measure, and chalk. I taped off where I wanted my rectangle, painted in the lines and removed the tape. Make sure there is enough room for all of your dates and place to write. I have 49 boxes. Seven across and seven down. The top row I use for my days. I left enough room above my calendar for some calligraphy because it’s fun to do. Add a couple of chicken wired filing baskets (I got mine from Amazon) to go under the calendar. I found some cute file folders to go in them. I found a scrap piece of wood for the chalk and eraser shelf. It’s not perfect, but who needs perfect when you have character. Every month I clean my chalkboard with Windex and Mr. Clean Erasers. Find a sponsor for your website. Get paid for your great content. shareasale.com. I like to make things or make things better. I keep a blog to journal my creations and share with you how you can do it yourself. Your privacy is important to me. When you post a comment your name and comment will be displayed publicly. I will receive your email address (this is our way to confirm you aren't spam), this will not be shared. If you make a purchase through my affiliate links, at no extra cost to you, I may receive a small commission. This helps with the costs associated with my blog. 2018 madesimplybystacey © | Bard Theme by WP Royal.